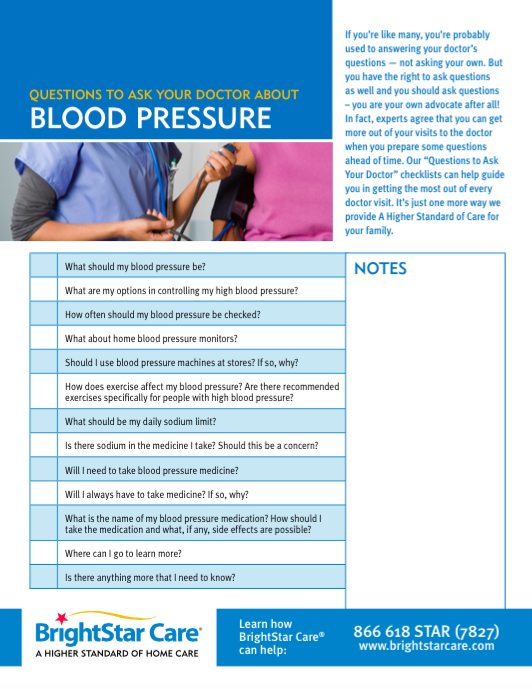 Click here to download the Questions About Blood Pressure PDF. What are my options in controlling my high blood pressure? Should I use blood pressure machines at stores? If so, why? How does exercise affect my blood pressure? Are there recommended exercises specifically for people with high blood pressure? What should be my daily sodium limit? Is there sodium in the medicine I take? Should this be a concern? Will I need to take blood pressure medicine? Will I always have to take medicine? If so, why? What is the name of my blood pressure medication? How should I take the medication and what, if any, side effects are possible?